Dr. Rice’s research focuses on the relationships between soil quality and soil microbiology. Dr. Rice is the recipient of many awards for his work, including the Nobel Peace Prize for his involvement as a member of the Intergovernmental Panel on Climate Change and the 2015 International Educator of the Year. 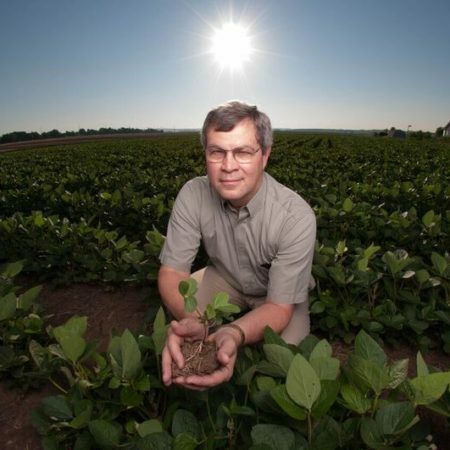 Dr. Rice’s research findings on soil organic matter dynamics have led to the innovative development of concepts related to soil organic C and N formation and storage. His lab has developed procedures for fractionating soil organic matter, and uses Carbon stable isotope analysis to determine rates of Carbon turnover, loss, and accumulation from the atmosphere and different vegetation. His research aims to improve of agricultural systems to increase soil carbon and nitrogen and resilience. Besides serving as the co-lead for the Ogallala Water CAP cropping systems/irrigation technologies Objective team, Dr. Rice will conduct research relating soil properties to drought resilience within the Ogallala aquifer region. White, P., and C.W. Rice. 2009. Tillage effects on microbial and carbon dynamics during plant residue decomposition. Soil Bio Biochem. 73 (1): 138-145. Wilson, G.W.T., CW. Rice, M.C. Rillig, A.C. Springer, and D.C. Hartnett. 2009. Arbuscular mycorrhizal fungal abundance controls soil aggregation and carbon sequestration. Ecology Letters 12:452-461. Fabrizzi, K., C. W. Rice, T. Amado, J. Fiorin, P. Barbagelata, and R. Melchiori 2008. Mechanisms of soil organic matter stabilization in temperate and tropical soils: Effect of native and agroecosystems. Biogeochem 92:129-143. McKinley, D.C., C.W. Rice, and J.M. Blair. 2008. Conversion of grassland to coniferous woodland has limited effects on soil nitrogen cycle processes. Soil Biol. Biochem. 40:2627-2640. Smith, P., D. Martino, Z. Cai, D. Gwary, H. Janzen, P. Kumar, B. McCarl, F. O’Mara, C. Rice, B. Scholes, O. Sirotenko, M. Howden, T. McAllister, S. Ogle, G. Pan, V. Romanenkov, U. Schneider, S. Towprayoon M. Wattenbach and J. Smith. 2008. Greenhouse gas mitigation in agriculture Philosophical Transactions of the Royal Society (B) 363: 789-813.